What makes it especially nice is the way I got involved in the project in the first place. It’s one of those times when the law of unexpected consequences brings good things into one’s life..
One of perks of combining music with journalism is that, every once in a while, a story turns into a different kind of collaboration. That’s what happened when I went to visit Jeff Haynes in his Beacon, NY, studio. 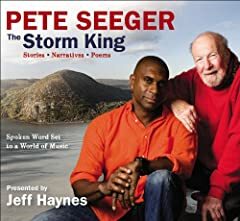 In Tune’s CEO Irwin Kornfeld had heard that the GRAMMY-nominated percussionist was recording the oral history of Pete Seeger and putting it to new music and thought it could make a good story for the magazine. So up I headed to Jeff’s studio last spring. I was expecting “interesting,” and was hoping for “very cool.” What I heard, however, blew me away. He had HOURS AND HOURS of incredible stories, and almost as much music. I spent a big chunk of the afternoon listening, and promised to write something when the project was released. In the meantime, it had taken only a couple of minutes with Jeff to get that “aha” connection that musicians can sometimes feel. He just had great energy and he sounded amazing on every track that included him. So while I don’t normally do stuff like this, I gave him a copy of Overtones before I left. A few days later, he invited me up to record something for the project. And to my humbling surprise, he used my solo acoustic version of Charles Mingus’ “Goodbye Porkpie Hat” behind Pete’s story about a precocious teenager named Martin Luther King. The story is so poignant that I uncharacteristically ignored my own performance the first couple of times I listened. My contribution is small in the context of the whole project. In addition to Pete—who sounds amazing—you’ll hear Dar Williams, Will Ackerman, Ralph Stanley, and many others. Jeff’s work bringing it all together into a whole that works on both narrative and musical levels is even more inspiring. Learn more on the project’s Facebook page. This entry was posted in albums, music, recordings and tagged emile menasche, Goodbye Porkpie Hat, Jeff Haynes, Mingus, Music, Pete Seeger, Storm King, Will Ackerman by Administrator. Bookmark the permalink.